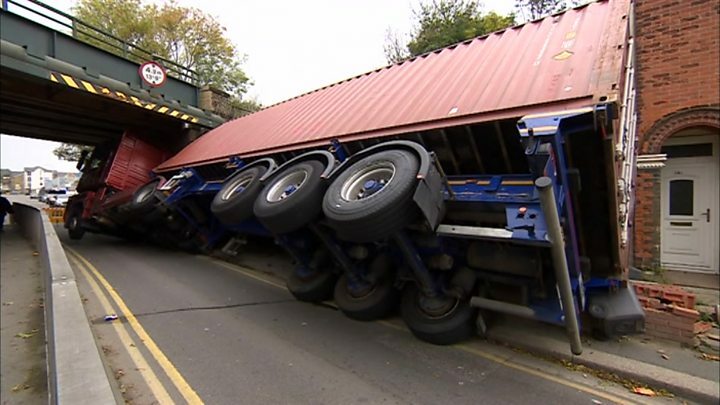 A family home has been hit a second time by a lorry which crashed into a nearby railway bridge. The vehicle toppled into the garden of the house in Coombe Valley Road, Dover, crushing its wall, at around 07:30 BST. The same thing happened last year. Adam Coleman, who lives in the house with his parents and sister - none of whom were in at the time - said their two dogs were trapped inside. He said: "My parents are frustrated because this keeps happening." The 29-year-old and his younger sister Lauren rushed home when news of the crash spread on social media. They discovered the lorry had demolished part of the garden wall and was blocking the path to the front door, trapping the dogs inside. He said: "Lauren was distraught when we heard what happened, she was worried about the dogs... and we were worried about [the damage]." However they soon heard the dogs, Alfie and Bailey, barking. Mr Coleman said: "We couldn't get to them or let them out but they were OK. We saw the damage wasn't too serious." He informed his parents David and Michelle of the crash by video call. He said: "[They] are frustrated because this keeps happening. This is the second time." It was 15:00 BST before a recovery truck arrived to start moving the lorry. A Network Rail spokesman said the bridge had not been damaged and trains were slowed but not delayed. Kent Police said there were no injuries.